Last year this memorial underwent some conservation work and it looks much better as a result. 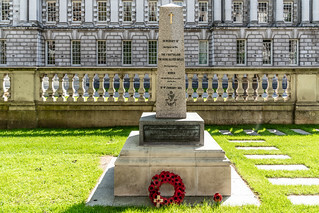 It honours the 157 men of the Royal Ulster Rifles (RUR) who died in the 1951 Battle of Happy Valley and elsewhere during a campaign against communist China. It came to Northern Ireland from Korea, installed at St Patrick's Barracks in Ballymena and when that base closed it was moved to the City Hall in 2010. "In memory of the Officers and Men of the 1st Battalion Royal Ulster Rifles, who lost their lives in Korea and especially those who were killed near this place on 3rd – 4th January 1951." "In memory of the Officers and Men of the 45th Field Regiment and the 170th Mortar Battery, Royal Field Artillery, who lost their lives in Korea and especially those who were killed near this place on 3rd – 4th January 1951."